Adopted by the College Faculty, May 11, 2016. Conceptual Competence and Scientific Comprehension. The student must demonstrate comprehension of the theoretical and scientific foundations of the profession. The student will be able to integrate fundamental concepts from the pharmaceutical sciences, clinical sciences, social/behavioral sciences and economics and apply these to individual practice settings. Critical Thinking and Decision-Making. The student must examine issues rationally and logically; shall acquire, evaluate, and synthesize information and knowledge relevant to an identified problem; and make logical, safe, and ethical decisions in both familiar and unfamiliar contexts. Communication Skills and Abilities. The student must read, write, speak, listen, and use appropriate technologies to send and respond effectively to communications for varied audiences and purposes. Information Literacy. The student must retrieve, analyze, and interpret the professional literature, critically evaluate the scientific credibility of information, utilize information technology and distribution systems that promote the safe use of medications, and provide evidence-based medication and health information to healthcare professionals and the public. Practice-Based Competency. The student will develop a foundational set of skills and abilities to provide consistent and comprehensive patient-centered care to all individuals regardless of demographic characteristics, disease state or therapeutic requirements. Team-Based Competency. The student will learn to collaborate and integrate effectively with pharmacists and other healthcare professionals to provide optimal health care services to patients. Leadership Skills and Abilities. The student will acquire knowledge of leadership traits and skills through curricular and co-curricular activities and develop skills and abilities that will enable him/her to lead or actively contribute to organizational improvement. Professionalism and Ethics. The student must demonstrate sensitivity to personal values and ethical principles in professional and social contexts. Cultural Competence and Social Awareness. The student must demonstrate an understanding of self, the strengths and challenges of cultural diversity, and utilize culturally sensitive and effective skills in delivering patient-centered care. Population Health Management. The student will promote health improvement, wellness and disease prevention by understanding and applying population-based data, processes and strategies to design individual and population-specific, evidence-based disease prevention and management programs. Self-Aware and Career Ready. The student will apply his/her knowledge, skills and abilities by engaging in experiences and activities that challenge the student to systematically evaluate and continuous develop his/her abilities and goals in order to enter into and thrive in his/chosen career path. 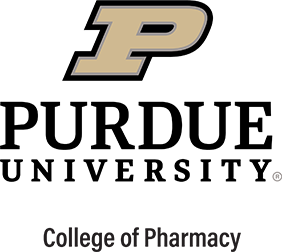 Approved by the faculty of the Purdue University School of Pharmacy and Pharmaceutical Sciences, February 19, 2010.
an understanding of pharmaceutics, pharmacology, toxicology, medicinal chemistry, therapeutics, and pharmacokinetics. be able to demonstrate a high-level understanding of the key stages in drug discovery, development, and commercialization. demonstrate an ability to relate applicable scientific disciplines to each stage of drug discovery, development, and commercialization. be able to identify the legal and regulatory issues that affect: a) development, b) conduct of research studies used in each phase of drug product development, and c) commercialization. be able to identify the questions addressed by research studies used in each phase of drug product development, and the decision-makers who use this information. be able to synthesize this information to create a preliminary drug development research plan for all phases of a new compound's life cycle. be able to identify the potential roles of BSPS graduates in drug discovery, development, and commercialization. For all students in the pharmaceutical sciences, the ability to effectively communicate via both written and oral media is essential. The need to integrate knowledge and learning in this field requires students to be able to share technical concepts and information with colleagues as well as non-experts. Mastery of oral/written communication will be achieved through a multifaceted approach in both the classroom as well as through practical experiences. Students will be required to apply their technical skill base to produce written documents and oral presentations demonstrating an ability to be clear, concise and show a logical progression of thought. Both individually generated and team-produced documents and presentation skills will be developed and evaluated. demonstrate proficiency in technical writing and presentations. demonstrate knowledge and proficiency with current audio-visual presentation technologies. demonstrate an ability to communicate scientific knowledge in non-expert/lay terms. develop examples of scientific communications (e.g., abstract, manuscripts, reports, poster presentations). demonstrate an ability to critically and constructively evaluate the presentations of others. The program will provide opportunities for the student to develop basic problem solving skills including the use of statistical analysis. The curriculum will utilize individual and team projects to strengthen skills in issue identification, root cause analysis, and solution development. demonstrate the ability to solve technical problems by integrating multi-disciplinary scientific knowledge and interpersonal skills developed through classroom and team project experiences. develop interpersonal skills such as influencing others, negotiating and working with others, conflict management, and informal/formal leading others through the problem solving process. demonstrate an ability to become a leading specialist in at least one of the areas of the pharmaceutical sciences that are integral part of pharmaceutical development. Ethical and socially responsible conduct Evidence of this conduct will come from an ability to identify and exhibit ethical, socially responsible, and socially aware behaviors in the classroom, workplace, and society in general. demonstrate awareness of cultural and social diversity through interactions with others. demonstrate a sense of self, community, and citizenship. demonstrate sensitivity to personal values and ethical principles in professional and social contexts. develop an understanding of social, economic, and professional responses to change in the pharmaceutical industry.